​Many more services to offer! Visit our All Services page to find all the pests we offer treatments for. When a technician from Gray Wolf comes to your home we inspect for these certain areas and communicate with the customer on what we see. Once your home is sized up we begin our treatment immediately focusing on the insects that are currently hiding in the cracks and crevices of your home. Gray Wolf Pest Control’s treatment includes an interior, exterior and perimeter treatment of your home to make sure that your territory is well maintained from seasonal invaders. As product degrades over a 2 month period, we will return to reinforce our barrier on the exterior treating in areas that will allow our product to not be affected by rain water and other elements. - Ground settlement causing cracks in the structure and allowing the ease of pest entrance. - Rot in decks, sills, joists, beams, fascia and rafters attracting ant and termites as they are favorable nesting sites. - Moisture forming in bathrooms, around plumbing, around refrigerators, dishwashers, washing machines, attracting many pests since pests do need water. ​Gray Wolf Pest Control guarantees results. 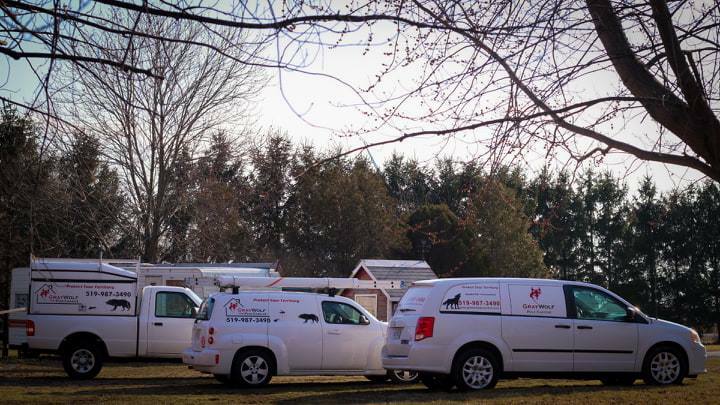 We manage your pests so you don't have to. If customers continue to experience unwanted insects that are covered in our program, we will re-treat the affected area(s) free of charge. We make sure to work with customers until they are satisfied.